I’m constantly on the lookout for the best deals on Women’s clothing. While some people buy clothes on a regular basis and have a clothing allowance, others only get clothing when they absolutely need it. So if you’re clothes shopping on a budget, you obviously want to find the best deals on clothing you possibly can. Whatever category you’re in, you probably like saving money on the clothing you buy, I’m guessing. With so many choices nowadays of women’s clothing websites, deals are everywhere. And no matter your budget, finding deals helps you to be able to either buy more of what you need or save more to go toward other expenses you have. So deals on clothing are a win-win for everyone! Here are some of the best sites I’ve found to find deals on women’s clothing. It’s no secret that Zulily is one of my favorite sites to shop for women’s clothing. I love that you can get great deals on great brands, and they offer such a variety of styles and sizes. Zulily has an amazing selection of quality plus size fashion, if you’re a plus size mama like me, you’ll definitely want to check it out. They have everything from jeans and t-shirts to dresses and coats. Shop Zulily’s current deals here. If you’re a regular reader you know that I love Jane, I’ve posted about them in the past. But what you may not know is that Jane is a deal site, which means their items are only available for a very limited time and then they’re gone, sometimes never to return again. So in other words, if you see something you want on Jane, you’d better scoop it up quick! One thing I Iike about Jane is they usually have a wide variety of Mom T-Shirts. Of course their selection changes daily but they seem to always have cute tees as an option. Have a looksie at the deals over at Jane here. 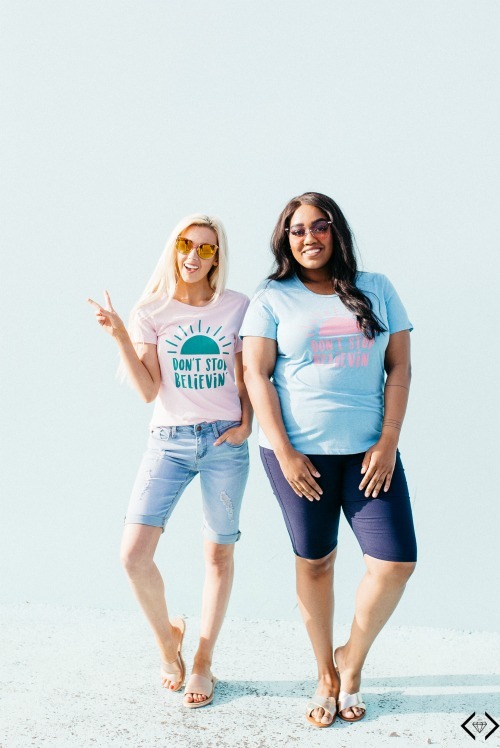 I’ve had the privilege of working with Cents of Style before, you can see my posts that include their awesome inspirational t-shirts by clicking the links below. I really like the clothing at Cents of Style. They carry everything from T-Shirts and pencil skirts to Kimonos and Ponchos. Even accessories like sun glasses, scarves, jewelry and bags. And don’t forget the shoes! The best thing is they run daily deals Monday through Friday on some of their most popular products. Check out what Cents of Style has going on deal wise here. You read that right, Amazon! After doing a little digging, I was amazed at the selection of women’s clothing on Amazon! I mean, they have a ton of stuff! Sweatshirts, t-shirts, blouses, leggings, jeans, and joggers. They have work clothing, casual clothing, beach wear, formal wear, and more. If you can think of it, it’s likely on Amazon. And their prices aren’t bad either on most items. I found this cute little Wifey sweatshirt I love and they have way more styles and colors too. Do a little digging for yourself, you won’t be disappointed! Secondhand Clothes. Firsthand Fun® is threadUp’s tagline, and I love it. They carry a wide variety of popular brands at a fraction of the cost of buying them new. Along with women’s clothing you can find maternity, juniors, and plus sizes too. If you want to try threadUp, here’s $10 to spend. Because I love ya! There you have it! Now you know where to find the best deals on women’s clothing. Where’s your favorite place to shop? Let us know in the comments! Thank you very much for the wonderful post. Now I know where to find the best deals on womens. I really like zulily’s deals. Really can’t believe their michael kors back are up to 75% off! I have purchased from Zulily before, but none of the other sites. I will need to check them out. Thanks for sharing! Excellent blog posting, on the regular basis I love to wear these type of clothes, These off the shoulder tops now in trend. Well, you give all the information about the sites and its services that will be very helpful to many people. You are right people are always looking for the offers and discounts on branded apparels apart from that they are also looking for the various products or we can free products and vouchers. All these things help while shopping.